Transcranial Magnetic Stimulation (TMS) uses short pulses of magnetic fields to stimulate nerve cells in the area of the brain thought to control mood. These pulsed magnetic fields may have a positive effect on the brain’s neurotransmitters levels. Treating depression with transcranial magnetic stimulation (TMS), may provide an alternative depression treatment for those who have not benefitted from prior antidepressant medication. In studies of “real life” clinical practice, approximately 60% of patients with treatment resistant depression responded to TMS. In a similar study, medications achieved only a 17% response rate. SeattleNTC provides the largest number of TMS treatments, and is the most experienced TMS provider in the Puget Sound area. 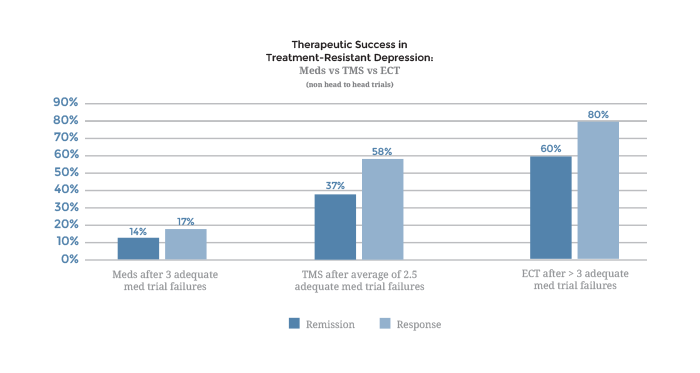 Treatment with TMS caused very few side effects and was generally well tolerated by patients. The most common side effect reported during clinical trials was scalp discomfort-generally mild to moderate and occurring less frequently after the first week of treatment. The TMS Clinician will then administer TMS over an approximately 15 to 45minute period. In 15 to 30-second intervals, the device will deliver rapid “pulses” of the magnetic fields. These will feel like tapping on your scalp. If a patient finds this tapping uncomfortable, your physician will make adjustments to reduce the discomfort.